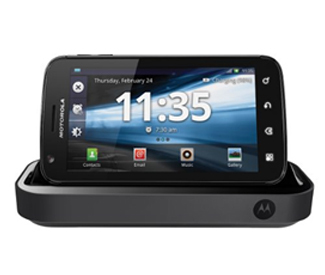 The Motorola Atrix 4G Multimedia Station Desktop Charging Cradle is the perfect companion for your Motorola Atrix 4G cell phone. The dock transforms your Motorola Atrix 4G into a multimedia experience, allowing you to watch movies and view photos. The Motorola Atrix 4G Multimedia Station Desktop Charging Cradle connects to your PC to charge your phone and synchronize data. Perfect for use as an alarm clock or to simply watch movies, get the full multimedia experience that your Motorola Atrix 4G has to offer with the Motorola Atrix 4G Multimedia Station Desktop Charging Cradle.